rain should play, and a volume icon should appear. no rain played, volume icon never appeared. What a lovely site! I usually use an app for that. :) Unfortunately, I'm getting a malware download warning when I visit. According to the debug information that accompanied your report, you're subscribed (as I am) to the Malware Protection filter list. RainyMood.com is on that list, which blocks sites identified as malware sources by the folks at Malwaredomains.com. If you're absolutely positive that site is safe, you can report this to Malwaredomains for re-investigation. Their email address is [email blocked] (remove the numerals; they are an anti-spam measure). the site functions with or without the malware protection enabled. There are two unrelated issues here. I think the malware warning is a false positive. I'll notify the malware admins about that. 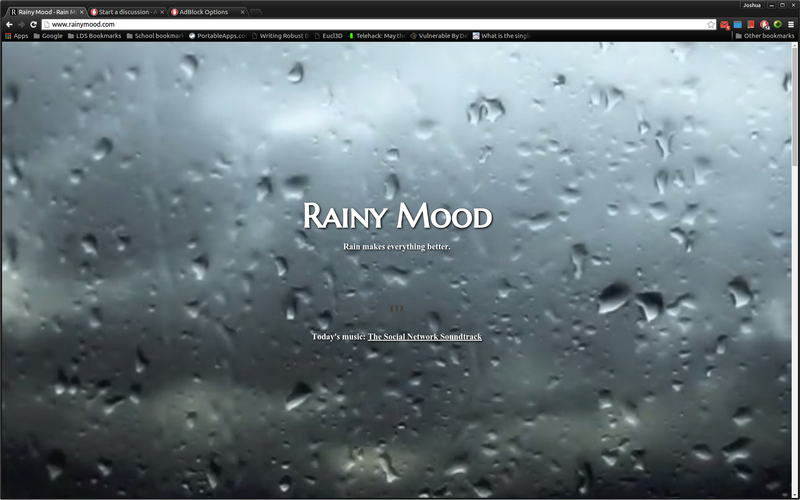 The other issue is that there's a broken filter in the Fanboy's Annoyances list that is preventing Rainymood.com from working. We don't maintain the filter lists. Please report this to the folks who do. You can find the contact info in our Knowledge Base. Thanks, and please let us know if you don't hear back from them within a few days!